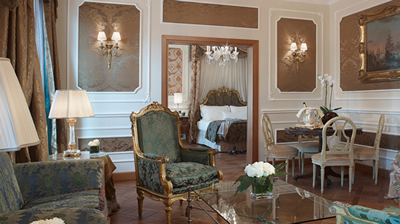 Milan is a wonderful city, and the Carlton Hotel Balglioni is a wonderful hotel. It is easy to love Milan. There is the magnificent Gothic Cathedral and an abundance of art and architecture – which includes one of the mankind’s finest paintings, Leonardo’s Last Supper. And there is more: the town’s obsession with clothes. For most Italians, dressing well is a daily routine. But for the Milanese it is a lifelong passion. I do not always share their taste, but I have to recognize that a Milanese without style is a contradiction in terms. Indeed, many of the town’s inhabitants are deeply involved in the business of buying and selling some of the most desirable garments in the world. And the epicentre of this activity is the famous Via della Spiga. Here are to be found the emporia whose names make the ladies (and not a few gentlemen) swoon. 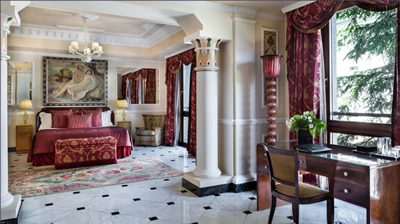 And here, too, is the splendid Carlton Baglioni. Actually, the main entrance is on the busy Via Senato, on the other side of the building. 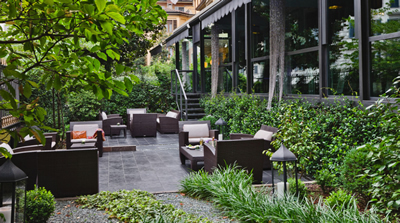 But it is the pedestrian entrance on the Via della Spiga w hich makes the location of this hotel so special. Still, whichever entrance I used, I found the abundance of marble, crystal and polished woodwork in the lobby area much to my liking. The feeling is of old-fashioned comfort and luxury. Yet this is a place which appears much older than its years. You might think it has been here for a century and a half. In fact, it was opened only in 1962. Nevertheless, it possesses the grand stateliness of an ancient establishment. And that is one of the highest compliments I can pay to any hotel. 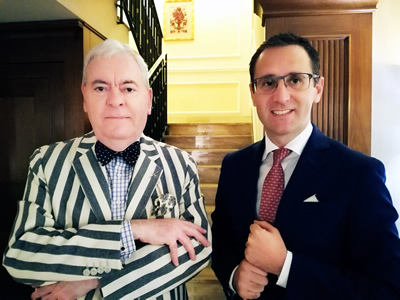 Moreover, it has a General Manager who is perfectly attuned to ensuring that those who seek out the highest levels of luxury and service feel entirely at home. I first met the charming Lorenzo Soleri – pictured with your correspondent – at the Hotel Caruso in Ravello. He impressed me in Ravello, and now he impressed me in Milan. Mr Soleri is a gentleman. I need say no more. The hotel has around 100 rooms. 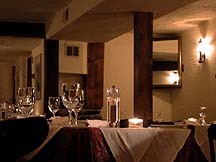 All are comfortably furnished, some in a modern style and some in the traditional manner of an Italian luxury establishment. I prefer the latter, and so was very pleased indeed to be shown up to the second floor to room 236, The Leonardo Suite (1,000€-2,000€ a night for two, according to season). Double doors opened to reveal an apartment of gilt, crystal, marble and costly silks. In the sitting room I found a gilded console table resting upon a floor of black and white marble. On the walls were panels of green damask and from the ceiling hung a crystal chandelier of nine lights. Seating was provided by a sofa and two easy chairs. All this was very much to my taste, and so was the coffee produced by the swish machine manufactured by De Longhi. Through another set of double doors was the bedroom, with a vase of white roses, a pair of carved gilt fauteuils, a writing desk and a bed (topped by a Roccoco-style headboard) which had been made supremely comfortable for my ailing back. I do not travel lightly, so the dressing room – with its ample hanging and cupboard space and a private safe – was useful. 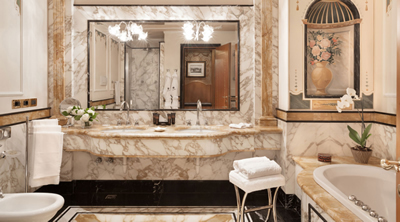 And so, too, was the large bathroom, clad in grey-veined marble. I do dislike any hint of claustrophobia during my ablutions, but here there was plenty of space for the substantial bath tub, the walk-in shower, the two wash basins and the loo. Lots of fluffy white towels and fine ‘Ortigia’ toiletries meant my early and evening bathings were moments of real pleasure. Each morning I went down from this civilised retreat to the bright breakfast room, a glass construction at the front of the hotel, with supportive armchairs and views to the outside greenery. (Here meals are served throughout the day.) From the buffet I secured bacon, poached eggs, cakes, ham, melon, pineapple, cheese, tomatoes and brioche, all of good quality. One small incident will serve to indicate the high level of service I received from every member of staff I encountered at the hotel. The only corn flakes on the buffet were of the modern, ‘organic’ kind. I tried them. I am sure they were healthy, but they were not for me. I mentioned my difficulty to one of the waitresses and – lo and behold! – the next morning a bowl of proper Kellogg’s corn flakes was set down before me. 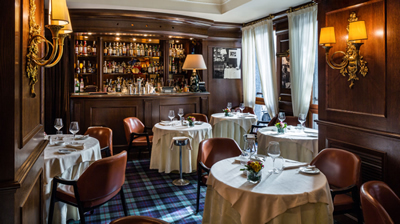 As well as this all-day facility, the hotel houses one of the most highly regarded restaurants in Milan. Indeed, if you are looking for the best traditional Italian food in the city, this is the dining room to which you should head. (Actually, there are two dining rooms. I chose the one for non-smokers.) I just adore Il Baretto. It is a magnificent broadside against all the fads and silliness which disfigure too many ultra-modern establishments. 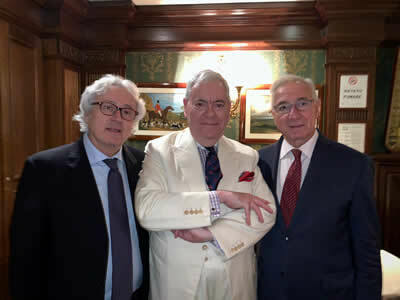 My picture shows me with the two owners, Ermanno Taschera and Vincenzo Zagaria. They are the guardians of a magnificent culinary tradition – a tradition which provided a dinner which had me purring with delight at its excellence. Intriguingly, the décor was designed to suggest “an English clubhouse of the early 1900s”. Over its fireplace is a map of London. There is much dark brown, dark green and polished wood. Its armchairs are upholstered in leather. The glasses are by BormioIi and the starched napery is as it should be – white. It sounds intimate and comfortable – ‘clubby’, in fact – and such it is. Mr Taschera showed me to my table and caused the candle in the silver candlestick to be lit. I sat back and expected thoroughly enjoyable food. And that is precisely what arrived. 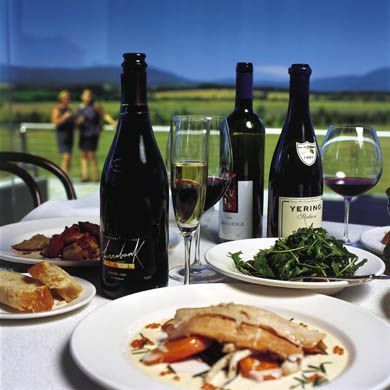 The offerings on the wine list are mostly Italian and French. Vintages are not given. Prices run from 30€ for a Lombardian red to 1,200€ for Chateau Cheval Blanc. Other bottles to catch my eye included my favourite Italian bubbly, Anna Maria Clementi (160€), Le Serre Nuove (80€), Cervaro della Sala (80€) and Planeta chardonnay (50€). My own drinking included a soft and gentle red from the Südtirol. This was a wonderful meal in a wonderful hotel in a wonderful city. If you like elegance and style, you cannot help being drawn to Milan. 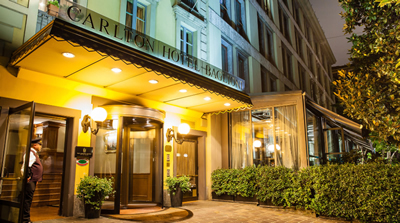 How good it is to know that the city has an hotel which embodies the elegant and stylish spirit of the Milanese – The Carlton Baglioni. Via Senato 5, Milan 20121, Italy.